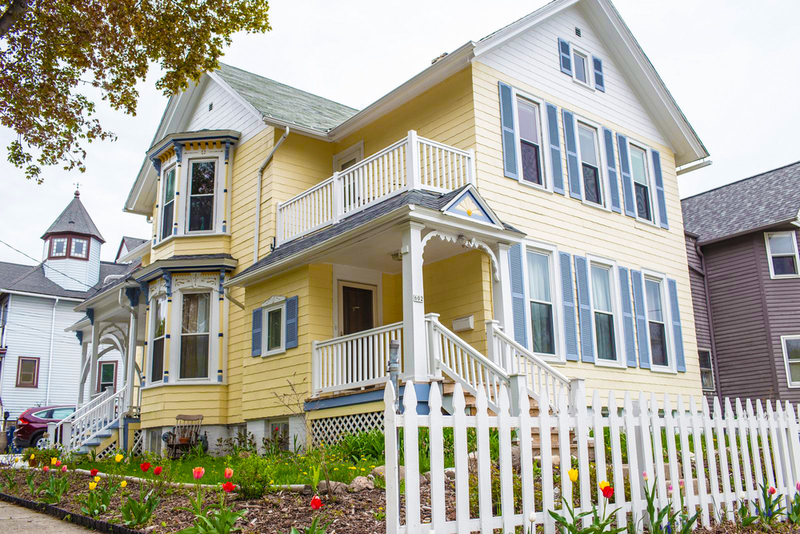 The Muse Gallery Guesthouse is a Bed and Breakfast/Vacation Rental Home occupying a Victorian Style home built in 1889. It is conveniently located between the airport and downtown on the corner of Lincoln Avenue and Winchester Street in the heart of Bay View – Milwaukee’s trendiest neighborhood! Purchased, remodeled and redecorated by Mary Ellen Hermann and Andrew Meechan in the spirit of the dynamic revitalization presently occurring in Bay View, The Muse Gallery Guesthouse provides 2800 square feet of fully furnished accommodations in an art gallery-like setting. Either individual Bed and Breakfast rooms or a self-catering Vacation Rental Home are available for a unique stay. A tasteful and interesting combination of modern and vintage furnishings are the “canvas” for an eclectic mix of rotating art available for purchase from local artists. The Muse Gallery Guesthouse is a stunning yet comfortable oasis sure to rejuvenate and inspire your body and soul! Experience The Muse, Bay View's Gallery Guesthouse. Purchased, remodeled and redecorated by Mary Ellen Hermann and Andrew Meechan in the spirit of the dynamic revitalization presently occurring in Bay View, The Muse Gallery Guesthouse provides 2800 square feet of fully furnished accommodations in an art gallery-like setting. Whether you’re looking for a bed and breakfast or a vacation rental experience, we invite you to book a stay with us at The Muse Gallery Guesthouse, where we offer flexible accommodation styles in one beautiful setting. Either individual Bed and Breakfast rooms or a self-catering Vacation Rental Home are available for a unique stay. Coming to Milwaukee for business or pleasure? Enjoy the dynamic mix of past and present in our lovely B&B rooms, and enjoy daily homemade breakfast and refreshments. House too small for visiting family and friends? Traveling to Milwaukee with up to 10 guests? Consider renting The Muse as a self-catering Vacation Rental Home for an artfully unique lodging experience. Committed to supporting local artists and inspiring our guests while living into our motto"Art for Everyone, Anywhere"!